Designed to keep the icing from drying out at the nozzle tip. Icing remains fresh for instant use everytime! 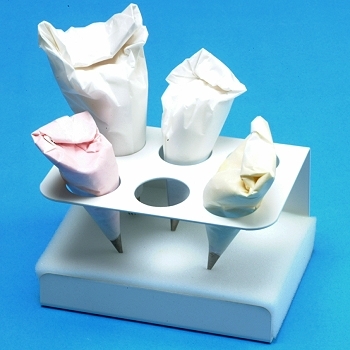 Stand has capacity for six small parchment icing bags. Dampen foam base with clean water and insert back into bottom of stand. Fill bags with icing. Place bags in stand. Ensure nozzle tips are in contact with the moist foam base. Dimensions: Length 5 1/2", width 3 3/4", height 3"
Metal base with white color.